I grew up pretty darn sure that I hated the taste of beets! They tasted like dirt! Bleck!!!! The reason WHY I felt that way is because I had never had a fresh beat - only canned. I happen to marry a man who loves beets and one day I gave roasting a fresh beet a try. I loved it! A fresh beet is VERY different in taste from a canned beet. Roasting beets brings out their natural sweetness and mellows their "earthiness." Peeling fresh beets can make a bit of a mess. However, if you scrub them, you can roast them with the peel on. After cooking, the peel is soft and slides right off. Roasted beets are wonderful sliced in salads or tossed with vinegar and olive oil. They pair great with goat cheese, feta cheese and walnuts. (1) Preheat your oven (or toaster oven) to 375 degrees. Wash and scrub the beets and place them in a small baking dish. (2) Drizzle the beets with a small amount of oil or spray with non-stick cooking spray. (3) Add a 1/4 inch of water to the bottom of the pan. (4) Tightly wrap the top of the pan with aluminum foil. (5) Roast until tender (you can check for doneness by poking them with a knife). Cook time will vary depending on the size of the beets, but is generally a half hour for very small beets up to an hour for larger beets. (5) Remove from the oven. When the beets have cooled slightly the peel will come off easily. Serve as desired. I made this recipe yesterday. I roasted two, fairly big, beets. It took two hours for them to be fully cooked. They were delicious. There was a nice caramelization in the pan. I must add that I even liked the smell, noticeable throughout my house, while the beets were in the oven. 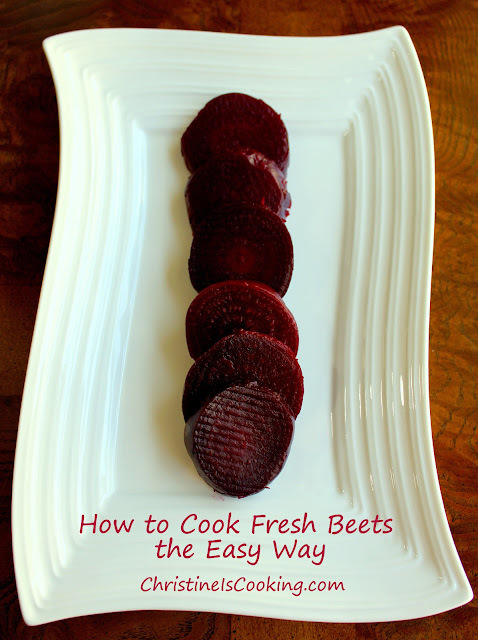 I think this is the best ways to cook fresh beets. Sometimes i want to keep the peel because it have many nutrition. Thank for providing a great recipe.